After talking to the different organisations Aufbruch Neukölln, IBBC e.V., Nachbarschaftsheim Neukölln e.V. and AWO), we did an analysis of the structures of the organisations compared to each other and which way they chose in order to realise their projects. Based on this we were able to formulate findings regarding [in]formality in community based organisations. Informal working processes within community based organisations can come out of the context of the formal system, because sometimes formal structures are too rigid. After speaking to Kazim Erdogan (Aufbruch Neukölln) we realised that he seemed very reluctant to talk about the institution (youth care administration office) that he worked at. We thought about this in the context of his informal work at Aufbruch Neukölln and came to the conclusion that his formal job was not very important to him. Our analysis indicates that while he worked for this formal institution he realised that the reaches of his work there was very limited and he saw a gap in the process. Kazim Edrogan tried to help in his own way, and was able to reach a larger community, by working outside of formal constraints. Through this study we discovered that informality can come out of formal organisation structures. The AWO organisation is a government initiated organisation, intended to provide counselling and support for families. Although we agree that the work they do is good and helps those in need, we also see that the structure that they work within can be limiting. The organisation is based at offices located in Neukölln and people seeking help have to visit during office hours. In this way we feel that the organisation has no room to grow, or to allow for change in terms of numbers of people they might be able to help. Informal working processes in community based organisations are able to work with a much larger community through different approaches as well as buzz marketing, since their participants are often multipliers at the same time. The IBBC organisation works with groups that have already been set up in the communities, and they work with existing structures. They supplement these groups and provide additional resources according to the group’s needs. In turn, the group members talk about the organisation and word is spread by mouth to others in the community and so the group grows in this way. In this case the organisation is funded by formal institutions that would alone not be able to reach the target communities. This organisation is important in making the link between formal institutions and groups that have formed out of need within the community. We question whether funding is a way in which informal initiatives are formalised. 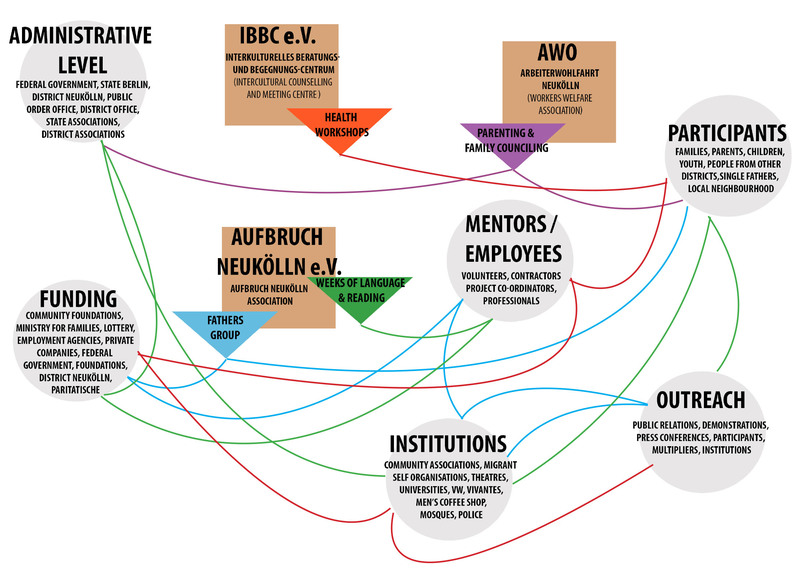 With IBBC e.V., as well as Aufbruch Neukölln and Nachbarschaftsheim Neukölln we encountered that their projects were funded from different sources (both governmental and private), and not just one financing body. Whereas AWO is purely government funded. Their contract states the work they do and the employee’s payment for a specific task. What makes Aufbruch Neukölln special is that Kazim is able to make personal requests to companies and private donators for extra funding that does not need a detailed financial statement. With this he can distribute money where he thinks needs it most. In some cases, organisations that contribute funds request a very detailed plan of the project which includes processes and budget breakdown. In this way, once an organisation is committed to this agreement, it is fixed and cannot be adapted if changes are needed; the initial plan has to be followed through. In other cases when funding is given without a request for the plan of the project, it allows the organisation to allocate and redistribute funds where they are needed in a certain project and it allows for adaptability. If organisations function on a voluntary basis, people need to make a living with another job and commit their free time. AWO, for example just takes instructions from a higher level, so there is no decision making by any of the employees. On the other hand, organisations that work with people that volunteer are more free in making decisions such as what projects they take on, where the funding will come from, the processes of initiation of the different projects, and the people included. We also developed some ideas about which organisations were more prolific in terms of reaching the community. 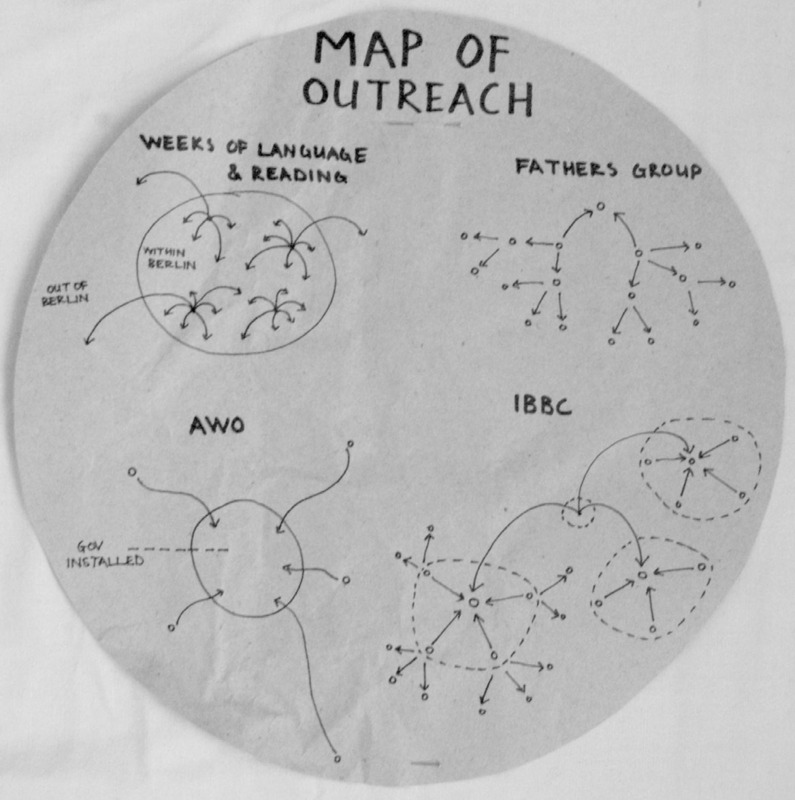 These diagrams are our interpretation of the reach (or extent) to which these organisations influenced local communities and beyond. The weeks of Language and Reading started as a festival in Neukölln for the local neighbourhood, over time reached out to many more people in Berlin, not only Neukölln and even further. This is shown most impressively by one action during the festival: books were collected and were hung on trees in four different parks in Berlin. The books were donated and the intention behind this initiative was to pass on the books after people had finished reading them. The books included a register within the cover, where people entered their information, so that you could see who read the book and where it went. This information was also made available on the internet, where a database traced the different books and the distances they travelled. The whole event showed that this initiative reached not only people within the neighbourhood of Neukölln, but it even extended beyond the borders of Berlin. The fathers group started off with Kazim Erdogan and two men, but every week the group become larger by word of mouth. The fathers group spread immensely and now has about 80 members. The organisation, Aufbruch Neukölln, receives a lot of attention throughout Germany, because Kazim Erdogan is invited to many public discussions, talks and he has many interviews, which publicises the association’s goals. IBBC e.V. used existing networks, and working through these they were able to expand and help a larger group of the community– they were also much more flexible, because different projects address different needs and people. In contrast to the above, AWO relies on people who come into their offices in order to receive counselling. This is limiting in terms of the location – people have to come to the office, also in terms of capacity – there are only a certain number of people that can be seen each day. How do we see our research in the greater context? Neighbourhoods are seen as a central space for inhabitants of the city, a heterogeneous space, a site of interactions, conflicts and togetherness. Cities always consisted of migration – and there will always be migration towards cities. The organisations we talked to, engaged in fields of disadvantaged people, that were often migrants or people with migration background. Our approach shows, how community based organisations can help to give creative solutions within these environments. Human rights also include the right to the city, although not stated in international or national law. As it is shown, community based organisations at grass-roots level can approach problems of disadvantaged people living in neighbourhoods and therefore create a sense of belonging, particularly important for the society in cities.